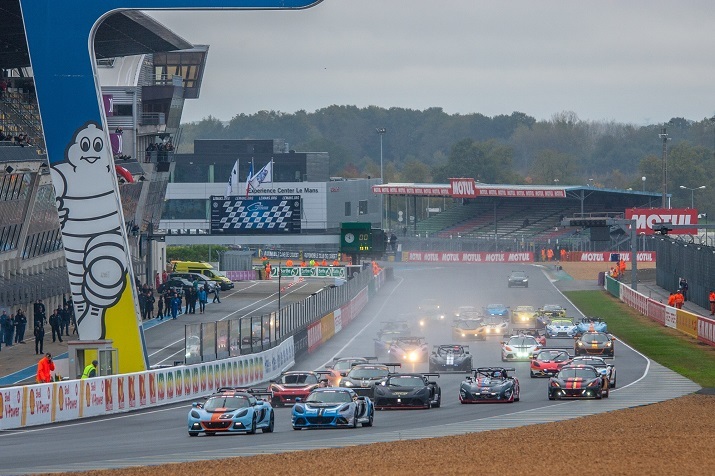 After 14 races in four countries over six months, the Lotus Cup Europe 2018 season reaches its climax in front of a huge crowd at the popular 24 Heures Camions event, with three races on the Le Mans Bugatti circuit in France. Last time out at Silverstone two podium finishes, including a win for Bence Balogh ensured that the Hungarian has amassed enough points to claim the 2018 championship. Closest rival Sven Pettersson may have lost out, but the Swede can at least race knowing that he has claimed the Production class title. Even with the overall and V6 Cup crowns in his pocket, it’s unlikely that Balogh will ease off the throttle this weekend. He’s been unafraid to attack when there are championship points at stake, so expect a full-on assault, which could potentially mean he ends the season with a remarkable 11 race victories – one more than outgoing champion John Rasse managed last year. There are, however, several rivals who will want to put their own stamp on the season finale. Rasse won twice here on his way to last year’s title, and with Steve Williams absent from the final rounds, Jason McInulty will be aiming to uphold British honour, having claimed his second victory of the season at Silverstone. Others to look out for include Frenchman Xavier Georges, Dane Nikolaj Ipsen, former champion Tamas Vizin from Hungary, and Briton Calum King, who stunned with a podium finish in his debut race at Silverstone earlier this month. The 2-Eleven class adds further cars to the entry, and several of these should be battling with the V6 cars, especially former race winner Anthony Fournier. However, whilst they may not have topped an overall podium, expect brothers Christopher and Franck Laroche to be the ones to beat this weekend. They’re almost certain to lift the 2-Eleven title this weekend, to add to Christopher’s 2016 Open class crown, and should amass enough points to achieve this in race one. With three Open class contenders this weekend, it’s likely that Andrew Wright will be crowned class champion. That, however, won’t stop David Harvey and his faithful 340R from trying to deny the S1 Exige driver from topping the class podium. Both were at the sharp end of the field at Silverstone, but may find the going a little tougher here. Ian Fenwick may be guaranteed a podium finish in this all-British category, but he’ll also be up for a fight with his immediate, and class, rivals. The entry is completed by a large Production class entry, which has seen five different winners so far this year. With seven to his name, Swede Pettersson may have done enough to lift the class title, having just missed out last year, but he won’t be letting up this weekend, and starts as favourite for honours. Other race-winners have included fellow Elise Cup R drivers Mark Yates from the UK, Swede Cai Cederholm, and Frenchman Thierry Hedoin. Amongst those looking for wins are Frenchman Jean-Pierre Genoud-Prachex, who made a mid-season defection from a 2-Eleven to an Elise Cup R, and former overall race-winner Jon Walker, in a Series 1 Elise.